–Mrs. Dashwood to her youngest daughter Margaret in the 1995 film adaptation of Jane Austen’s novel Sense and Sensibility. Today’s post is about the weather. This should be an exceedingly appropriate topic, if a certain esteemed fictional character has anything to say about it (though I’m not sure she does). Instead of four seasons, those of us living in Cambodia have only three — all of which fall within what I would call Midwestern American “summer.” That means that to the outsider, all of life here is just plain HOT. After living in Cambodia awhile, though, I’ve learned to discern the subtle differences between the seasons. Not only are there very small temperature differences between the highest highs and lowest lows, the beginnings and endings of Cambodian seasons are not intuitive to someone accustomed to a traditional four-season climate. (Even our home school science books discuss seasons from the temperate climate’s point of view.) For example, the hottest part of a North American summer does not coincide with the hottest part of the Cambodian year, and the temperature here never, ever drops below freezing (or 60 degrees Fahrenheit). One thing is the same though: the coldest Cambodian weather does correspond to the coldest weather in Midwest America. They both occur in December and January. Cambodia is still slightly above the Equator and tips away from the sun at the same time. But Missouri weather doesn’t get too uncomfortable until July, when Cambodian weather is starting to cool off. Strange? Yes. So today I’m talking about the weather, but I’m also talking about paradox. I often wrote about paradox during our first year overseas, and I’ve been forced to revisit it lately. In mission training, we learned to describe paradox in life as a “pair o’ ducks”: the yays and the yucks of life. Good and bad run on parallel tracks in life, and we cannot separate them, as much as I might wish to. In my black-and-white mind, I would like to label all things as purely good or purely bad. But life is more nuanced than that, and much to my disappointment, I cannot escape paradox. Rather than delving into the deeper yays and yucks in my life right now, I’d like to apply the pair o’ ducks model to the weather in Southeast Asia. I call it the Tropical Seasons Paradox. This is my best attempt at explaining the climate, though the time boundaries I give for each season are only approximate. Duration: Rainy season is about half the year. It starts approximately in June, when rain begins to fall, but is not yet heavy or daily. Rain usually comes in from the west. It picks up in intensity and frequency by about August, and peaks in October with a lot of flooding. Rainy season seems to end quite suddenly in late October or early November, though there might still be a few scattered showers after it officially ends. Yays: The rain eases the intolerable heat of hot season. As soon as the rains start, I remember (once again) that the heat is bearable most of the year, and I become a much happier person. Generally speaking, it rains in the late afternoon, and it can be quite cool in the open air or on our roof. Nights are usually comfortable in rainy season. The time frame for weather cooling off seems strange to a person from a temperate climate. How can it cool off in July and August, when those are the hottest months of the year in America’s Midwest? Yucks: The heat doesn’t relent fully until the rains get heavier, which can make for a still-pretty hot June and July. Then when the rains get heavier and more frequent, there is so much moisture in the air that laundry refuses to dry. It can take up to four or five days for some articles of clothing to dry in this kind of weather, but I don’t always have enough clothesline space to keep all the wet clothes on it. That means I spend extra time testing every single item before taking it off the line, then rearranging the almost-dry pieces to be closer together, in order to free up space for the newly-washed items. (Whew! I need to take a breath now.) By about September every year, I’ve nearly lost my mind because of my damp laundry. There’s more sickness this time of year, because the flooding tends to spread water-borne illnesses. There are also more mosquitoes in rainy/wet season than hot season, though not the overwhelming onslaught that cool season brings. Duration: Towards the end of December, a cool breeze starts to blow from the north. It lasts until early to mid-January and does not typically include rain. The length of cool season depends on how long we receive a good, cool wind from the north. Cool season may be only be about two weeks, like our first cool season here, but it’s “supposed” to be one month or more. Last year when we were in America, our friends in Cambodia enjoyed a cool season that was both exceptionally long and cool/cold. Cool season is many people’s favorite season. Yays: It’s surprisingly cool for a tropical climate, and very comfortable. In fact, depending on how long you’ve lived here, you might even feel the need for jackets and blankets. You might want to wear jeans. There is lower humidity and little to no rain, so the laundry dries quickly. Yucks: Mosquitoes plague us during cool season. It’s the one thing that makes an otherwise perfect season, not perfect. (Paradox in action: no situation is 100% good.) Mosquitoes carry and transmit diseases like dengue, which can be dangerous without proper medical care. Besides the risk of disease, the extra mosquitoes are just, well, outrageously itchy. We have to be vigilant to kill them before bedtime in order not to wake up itchy and swollen. Duration: Hot season begins as cool season wanes. This typically happens in March. It’s hot (90’s and 100’s Fahrenheit) for three solid months: March, April, and May. Sometimes the end of February is hot: our first year here, for example, hot season started in late February, but the rains started earlier than usual, in mid-May. This past year, the temperature wasn’t unbearable until mid-March; however, the heat didn’t abate until mid-June, when rainy season finally started. So there are three solid months of heat in a place where there is no central air-conditioning, and where most buildings are open-air. It gets HOT. It usually only rains a couple times during hot season. Again,the time frame here is unexpected: the hottest months of the year shouldn’t be in March, April, and May. This makes no sense to a person accustomed to April still being chilly. Yays: There are no nightly mosquito-killing fests, because there are almost no mosquitos in hot season, which is a pleasant change. Also, it’s so hot that the laundry dries right away. No checking for dampness, no mold or mildew on the clothes. (Paradox in action: no situation is 100% bad.) I don’t personally like mangos, but my family does, and hot season is the only time of year you can eat sweet mangos. (The rest of the year the mangos are sour and green, but not everyone likes them that way.) My family loves to chow down on mangos every day in hot season. We know hot season is winding down when the mangos get mushy and overripe, or, alternatively, become firm and sour again: no more sweet mangos till next hot season. Yucks: It’s hot. Excruciatingly, relentlessly hot. Riding a tuk tuk or moto through town gives no relief from the heat (whereas riding a moto or tuk tuk during cool season, or in the middle of a rainy season storm, can feel downright freezing). It doesn’t cool down even at night — nighttime bedroom temps can linger in the 90’s – and we don’t sleep as well. We get dehydrated more easily and are more tired. Even a trip to a local swimming pool might not be refreshing; the pool water is often too warm to be enjoyable this time of year. This is probably most people’s least favorite season, even though there are a couple yays that accompany it. Fortunately, however, the stifling heat lasts only three months, leaving the rest of the year survive-able. There’s a funny thing that happens at the end of rainy season. My laundry hasn’t dried in months, and Jonathan usually gets really sick a couple times during rainy season. I feel like I’m about to lose my mind by the end of it. Then suddenly, the rain stops, and my laundry dries. I feel sane again. But in November, the cool breeze from the north hasn’t kicked in yet. It gets hot again, and I feel frustrated repeating the heat. It’s not rainy season. It’s not cool season. What is it? Even Cambodians say it’s another season, although I’m not sure what they name it. 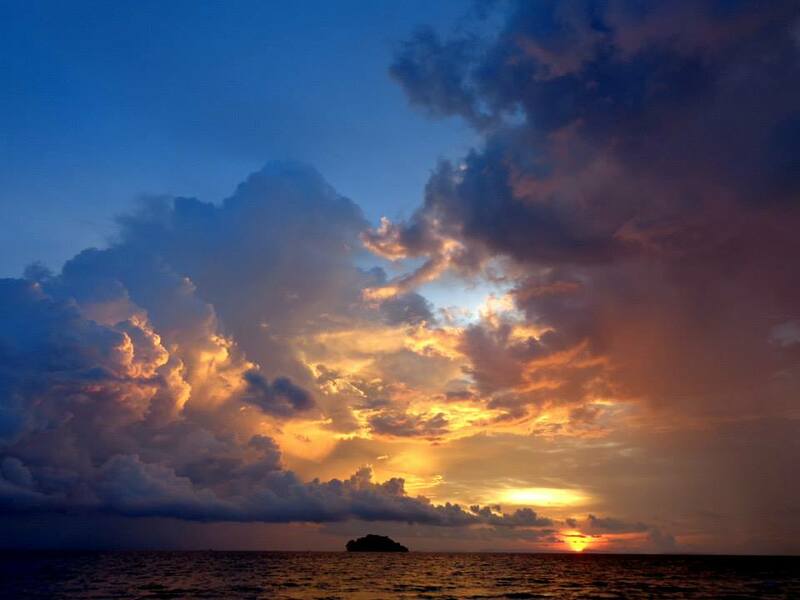 Regardless of the yucks of each season, Cambodian skies are still some of the most beautiful on earth. 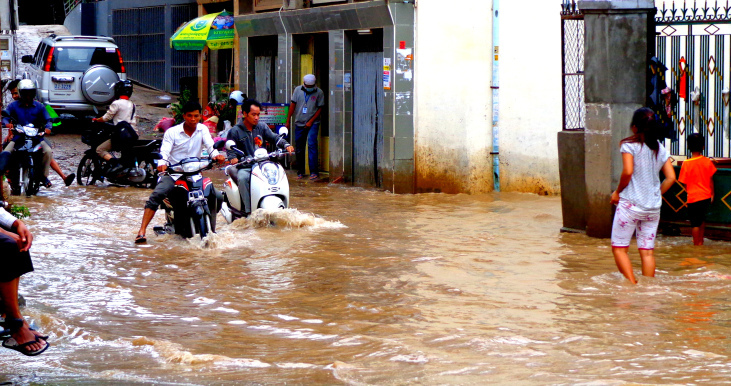 Everyone asks us, “What’s the weather like in Cambodia?” We usually just say “hot & wet or hot & dry” to keep things simple. I think I’ll point people to your post if they want more details. 🙂 We’re going to enjoy fall in Midwest America, a tiny bit of winter here, and the cool season in Cambodia in January, then brace ourselves.